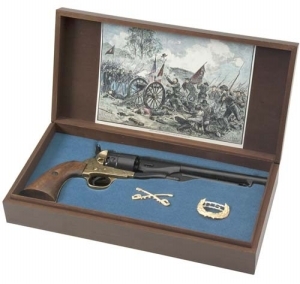 Gettysburg Historic Boxed Set: Includes a full-size, non-firing, M1860 army percussion revolver inserted into a custom foam mold with velvet-like finish. An engraving depicts General Pickett's Confederate troops attacking Union troops. Comes with cavalry insignia and hatpin. Wood box Dimension size: 14.5" X 7.25" X 2.5".